When all you need is a basic understanding of goniometry, supplemented by concise and illustrative examples of the-look to Cram Session in Goniometry: A Handbook for Students and Clinicians for quick and "at your fingertips" facts. 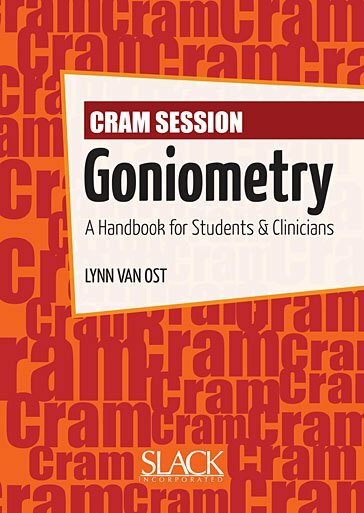 Cram Session in Goniometry by Lynn Van Ost is a concise and abundantly illustrated quick reference which provides the rehabilitation professional with a very basic approach to various goniometric techniques. Organized in a "head to toe" format, Cram Session in Goniometry takes user-friendly and efficient learning to a new level. Cram Session in Goniometry: A Handbook for Students and Clinicians is an informative, well-organized handbook for all students and clinicians in physical therapy, occupational therapy, athletic training and orthopedics. Lynn Van Ost, MEd, RN, PT, ATC, graduated in 1982 with a bachelor’s degree in nursing from West Chester State College, West Chester, PA; NATABOC certified in athletic training in 1984; graduated in 1987 from Temple University, Philadelphia, PA, with a master’s degree in sports medicine/athletic training; and received a second bachelor’s degree in physical therapy in 1988 from Temple. In addition to treating the general orthopedic population as a physical therapist, she has worked with both amateur and professional athletes and has more than 11 years’ experience as an athletic trainer working with Olympic-level elite athletes at numerous international events, including the 1992 and 1996 Summer Olympic games. She currently works as a clinical specialist in sports medicine at Hunterdon Medical Center in Flemington, NJ.